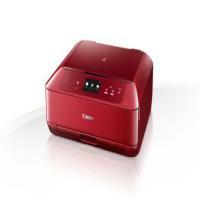 Canon Pixma MG7752 is a good-looking inkjet printer that comes with a metallic-red shade. It provides remote printing, scanning and copying options. The device offers direct printing options using smartphone and tablets. All thanks to Canon print apps. Pixma MG7752 weighs 7.9 kgs and measures 37 x 43.5 x 14.8 cm which is comparatively higher than other Canon home printers. The integration of touch-sensitive LCD screen makes operations easy and quick. The text printing and photo printing quality are impressive with a print resolution of up to 9,600 dpi. Six individual Canon Pixma MG7552 ink cartridges improve output quality with the extra pigment black ink. WiFi Direct and NFC are available to connect and print from smart devices using the Canon Print app. While PIXMA Cloud Link app is available for Cloud printing and scanning. Besides, the printer is also compatible with some of the Windows and Mac OS. Canon Pixma MG7552 is a 5-ink all-in-one that offers printing and scanning remotely. Excellent printing quality and reliable speed coupled with an intuitive touchscreen allow users to enjoy operating the device. The Canon Pixma MG7552 ink cartridges are available for separate installation meaning that you just need to replace the ink that runs off - reducing printing costs. With all the features considered, the device can turn out to be an ideal purchase for home and family users. How to check the estimated ink level for the Canon Pixma MG7752 printer? Make sure that the printer power is turned on and display the home screen. Click the ‘Home’ screen and select the Setup button. Launch the Canon IJ Status Monitor. On the Maintenance tab, select View Printer Status. The Canon IJ Status Monitor opens and displays an image related to the ink status. You can also check the ink-related information by clicking ‘Ink Details’ button. If any warning or error related to the remaining ink volume occurs, a notification icon is displayed at the top in the Ink Details dialog box. You can also illustrate the Ink Details dialog box by selecting the ink icon on the Canon IJ Status Monitor. Note: If you have installed a remanufactured or refilled Canon Pixma MG7752 ink cartridge or an ink cartridge that has been already used in another printer, the ink level indicator might be inaccurate. Warnings: Ink level indicators and warnings are provided for your proper planning purpose. If you receive a low ink warning message, it simply indicates that you should be ready with a replacement cartridge in order to avoid any printing delay. Once you start getting poor quality prints, you should replace the Canon Pixma MG7752 ink cartridges. What to do if the Canon Pixma MG7752 pages are skewing? When the Canon printer pages are skewing, make sure that the paper you have loaded in the input tray is aligned to the paper-width guides. If necessary, pull out the paper input tray and reload the pages in the proper manner (the paper guides should be aligned correctly). Q. What types of memory cards are compatible with a Canon Pixma MG7752 printer for printing photos? A. You can use Memory Stick Duo, Memory Stick PRO Duo, SD Card and SDHC Card for printing photos with this printer. Q. Do you also provide paper media on your website? A. Yes, we provide various types of paper for your printer. Just make sure that your printer is compatible with the paper type before purchasing. Q. I have spare Canon Pixma MG7752 ink cartridges as my printer no longer works. I am looking to buy a printer that uses the same ink cartridges as I am happy with the printing quality. Is it possible for me to find other printers using the same ink cartridges as the Canon Pixma MG7752 printer? A. Yes, there are various printers that use the same ink cartridges as Canon Pixma MG7752 printers. You can find a list of printers compatible with these ink cartridges on the packaging of the ink cartridges. You can also find the whole list here. Q. What is the benefit of having individual ink cartridge slots in my Canon Pixma MG7752 printer? A. Having individual ink cartridge slots helps reduce wastage and also enables users to cut down on their overall operational costs as they only have to replace the Canon Pixma MG7752 ink cartridge colour that has run out. Q. How is the print quality of Canon Pixma MG7752 printers? A. Canon Pixma MG7752 printers are capable of printing high-quality texts and images. They can print black and white printouts up to a resolution of 600 x 600 dpi and coloured printouts up to a resolution of 9600 x 2400 dpi. Q. Is it possible to refill my Canon Pixma MG7752 ink cartridges once they are empty, so as to reduce my costs? A. Yes, you can refill Canon Pixma MG7752 ink cartridges once they are exhausted. However, refill ink cartridges is a complex process, if not done properly, it can cause damage to the cartridge. You can also opt for our compatible ink cartridge instead, as they are as cheap as refilling ink cartridges and will provide you with great print results.